Dear Alice Waters: All is forgiven. Welcome home. Even though my Apple Jellies catastrophe proved to be my own fault, I was still somewhat miffed about the whole thing. It’s a bit hard to jump back into a cookbook that has resulted in a kitchen fail, whatever the reason. But, summer has arrived in the Pacific Northwest – tentatively, to be sure, but still, it’s warm enough that I can no longer hide under big sweaters and the one pair of jeans that I’ve been wearing that fit and are also on the verge of disintegrating under burden of daily wear. In short, it’s time to diet, and that means veggies and salad. I figured I should start with my favorites, so I chose beets, which I love, for being bright red, tasty, and filling, all rolled into one. I have a very simple recipe I usually use, but since I’d come across some blood oranges (finally! ), I thought it would be nice to use those, too. So I poked around a bit and ran across several references to Alice Waters’ recipe for Marinated Beets, from The Art of Simple Food – the same cookbook as the Apple Jellies recipe. The cookbook I have not opened since I bought it. The recipe is brilliantly simple – roast the beets, marinate them in orange juice or vinegar, and toss with salt and a little bit of olive oil. That’s it: you’re done and they’re delicious. I didn’t add any herbs to mine, an option Waters suggests, but I think a bit of fresh rosemary would be spectacular. 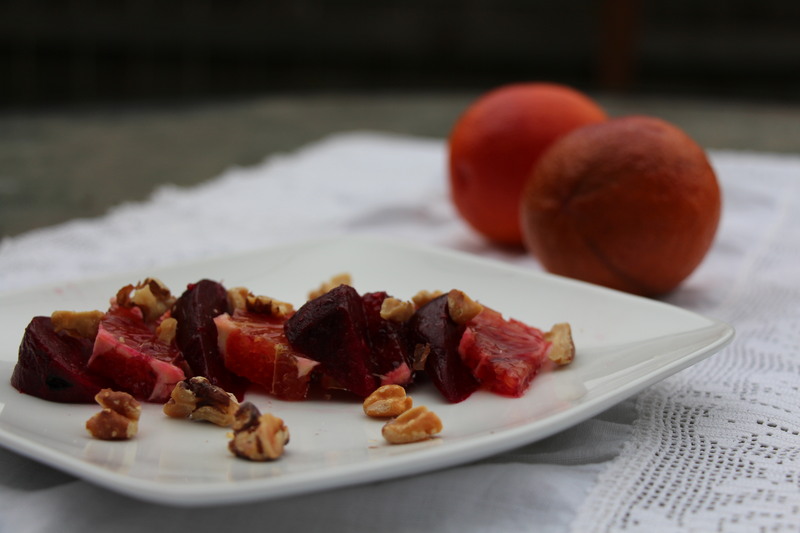 I made a large batch of beets, using the juice of blood oranges, and made a couple of lunch salads with the beets: the first with walnuts and oranges; and then when the oranges were gone, tossing the beets with some crumbled goat cheese and walnuts. I made another batch of beets using fig vinegar instead of oranges – it was lovely too (somewhat sweeter). Walnut oil would be an excellent substitute for olive oil. Waters suggests a couple of other simple variations in the cookbook, or you could make up your own. Or just keep it simple. Trim the greens to ½ inch from 1 pound beets. Wash thoroughly. Put them in a baking dish with a little water (enough to cover the bottom of the dish to a depth of ⅛ inch) and sprinkle with salt. Cover tightly and bake the beets in a 350°F oven until they can be easily pierced with a sharp knife, 30 minutes to 1 hour, depending on their size. Uncover and cool. Cut off the tops and roots and slip off the skins. Cut the peeled beets into small wedges or ¼-inch dice and sprinkle with 1 teaspoon orange juice, zest, and salt. Let stand for a few minutes to allow the beets to absorb the flavor. Taste and add more salt or juice as needed. Toss with 1 to 2 teaspoons extra-virgin olive oil. You can use any kind of beets, as well as any kind of orange (I used blood oranges because they were available) for this. You can substitute 1 teaspoon vinegar (wine or sherry) for the orange juice. You can also add a pinch of fresh herbs, such as rosemary. The beets make a marvelous salad, and I served them with blood orange segments, toasted walnut pieces, and then added some crumbled goat cheese just before serving. This is my contribution to Weekend Cooking, hosted by Beth Fish Reads. Why not swing by and see what other delights await this week? I am not a big fan of beets but this does sound tasty. I’m not a big fan of beets either, but this recipe appeals to me. I may have to try this. I love, love, love beets and these sound heavenly. Plus I love the ways in which you are eating them. I throw them into tossed salads. And now Carole has given me a great idea — I want to try it with my next burger. I love beets, too. There’s nothing better than roasted beets with a bit of acid to cut the sweetness. I’m sure the oranges were fabulous, but I’m really interested in the fig vinegar. I’ve never seen that before. I can’t eat beets. But my husband loves them, so I save beet recipes for when I want to be nice to him. Pinned! I love finding new ways to incorporate beets into our meals!